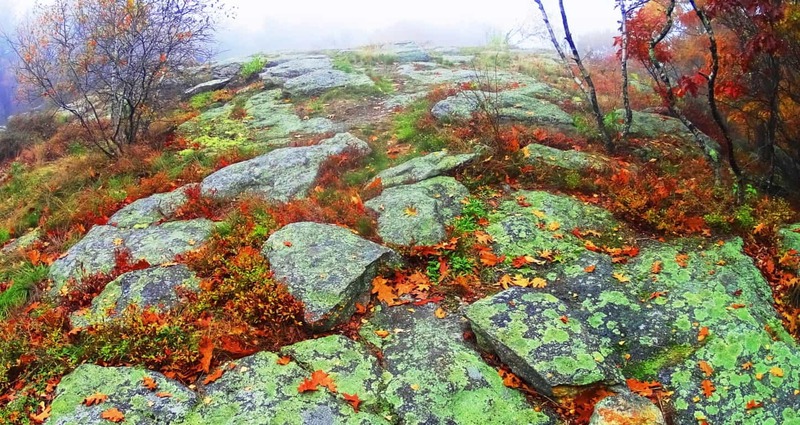 Note: The Blue Hills is a quintessential New England hiking area, with the perfect combination of rocky pathways, quiet groves, elevated vistas, and mysterious stones. 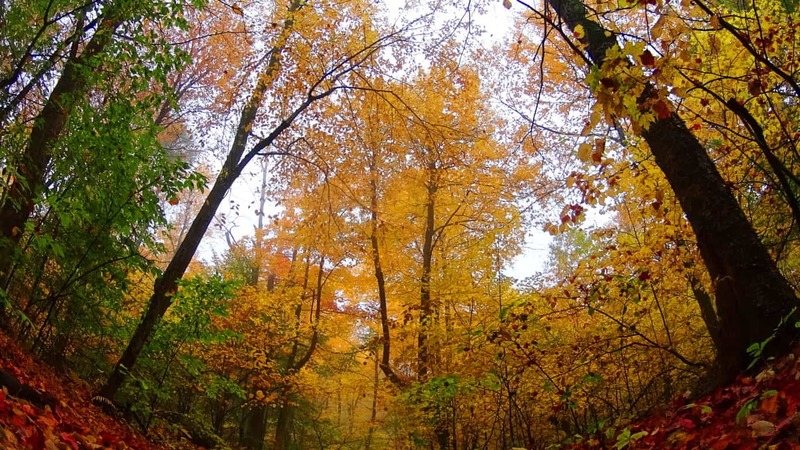 Trails include the Walcott Loop, the Skyline Trail, Rattlesnake Trail, Great Blue Hill, and dozens of minor trails to be discovered. 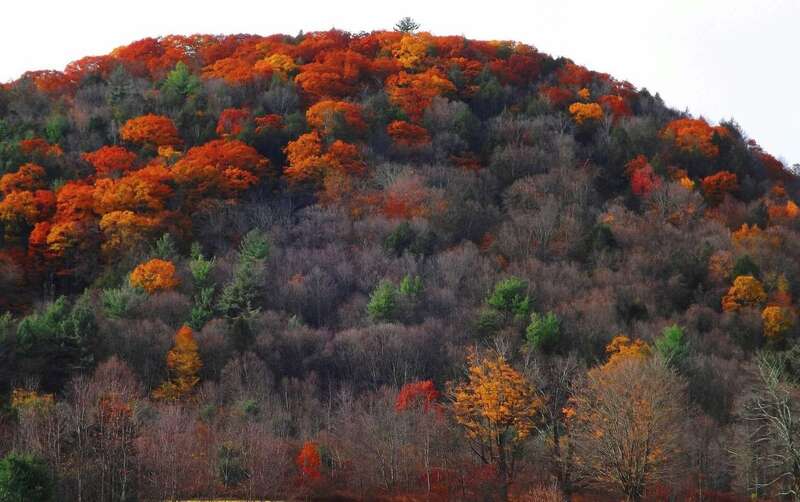 Great Blue Hill is the highest elevation here at 695 feet. There is over 6000 acres to explore, with the option to mountain-bike, which thousands of people enjoy during the Spring season. 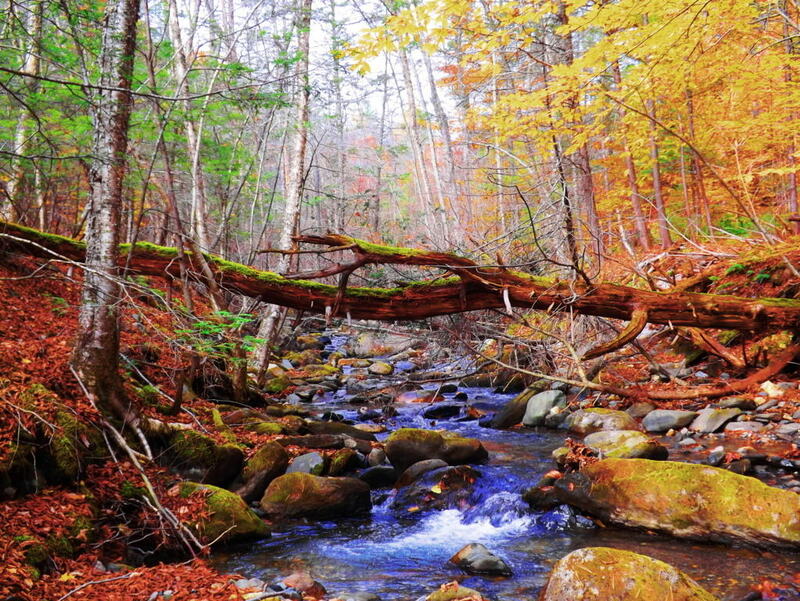 There is preserved old-growth forest, inclusive of 100 foot Pines, small Birch groves, Hemlocks, and Oaks. 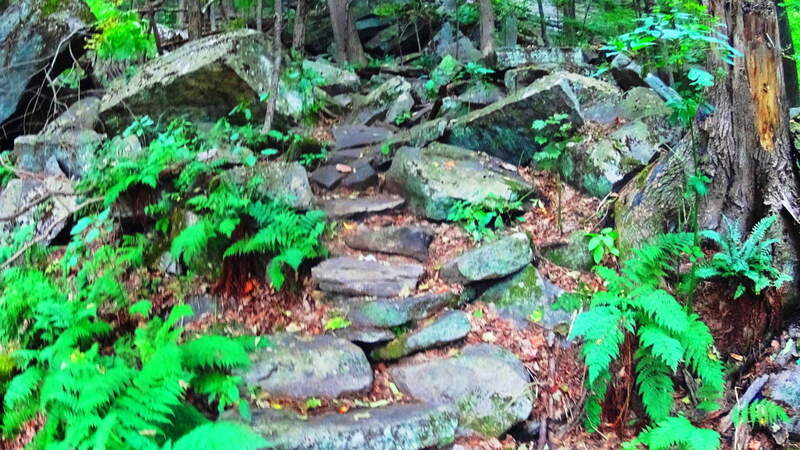 Some of the trails are wide pathways lined with small cut stones, while others are staircases cut right out of the hills. 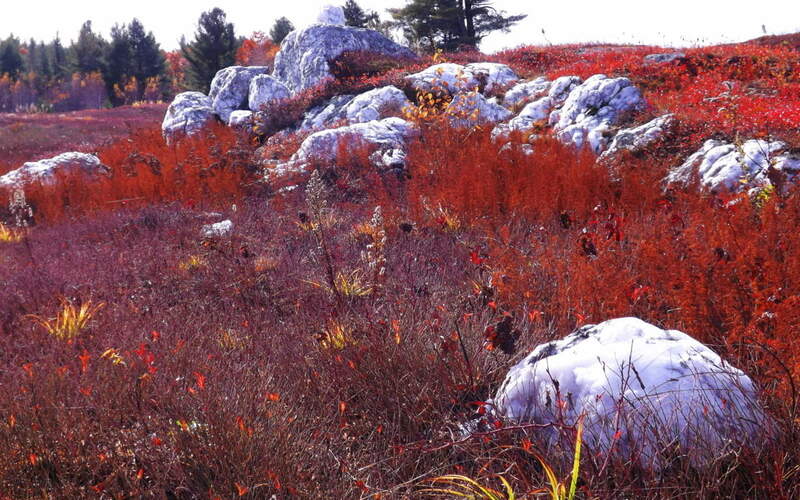 Blue Hills was a sacred place for the Native Americans for thousands of years before the Europeans arrived. We can certainly see why. The Colonials that arrived in the “New World” were fleeing what they considered to be a completely bought-out scene in England, Scotland, and Ireland. Lords and Men-of-property owned, and taxed, all the land, from the Medieval period into the Colonial. The 17th century in Europe was actually a “late’ period in terms of land ownership. Everything was owned. 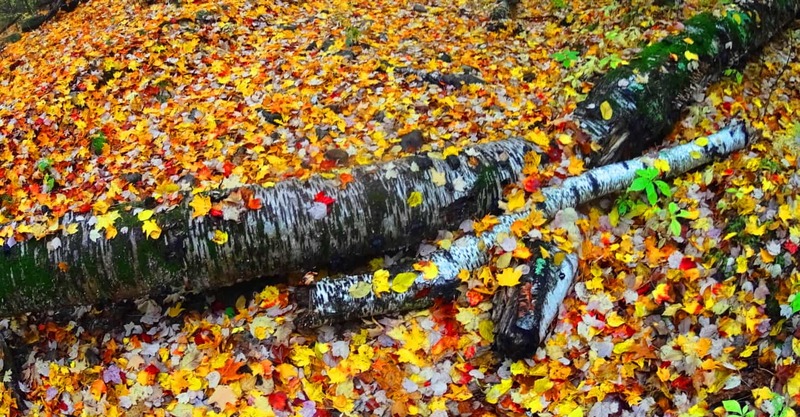 There was nothing left. Christian Puritans found the state of affairs in London, and elsewhere, intolerable. They decided to take their chances on getting their own land across the Atlantic Ocean. 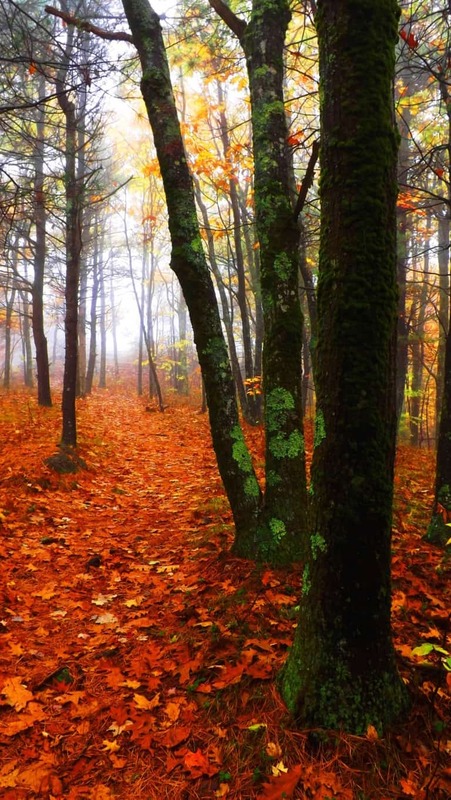 When these mostly poor pilgrims, explorers, trappers, and farmers arrived, and began to explore the forests and hills of this wilderness, what they found, in places like Blue Hills, would absolutely astonish them. 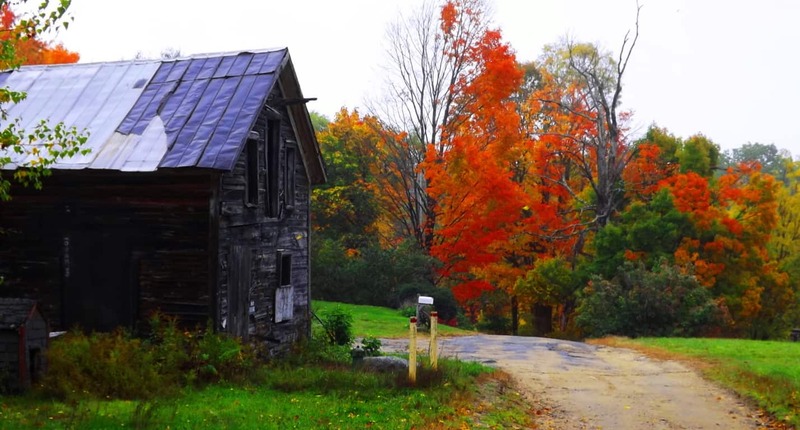 Secret History: The image above is a look at the countryside southwest of the beautiful city of Boston in April 2016. It was in this exact season in 1775 that King George of England issued a mandate to General Thomas Gage for the disarmament of the resistant colonials living in this beautiful region. It was yet another attempt to expand England, and possess these abundantly fertile hills. I have to believe, looking at this picture, that the colonials felt this was a place, if ever there was one, that was absolutely worth fighting for. There is something even deeper about the landscape that colonial farmers must have noticed in their appreciation of the terrain. Colonial frontiersmen would have looked for advantageous areas to live, strategically smart elevations close to running streams, with crop potential and forestry for building. 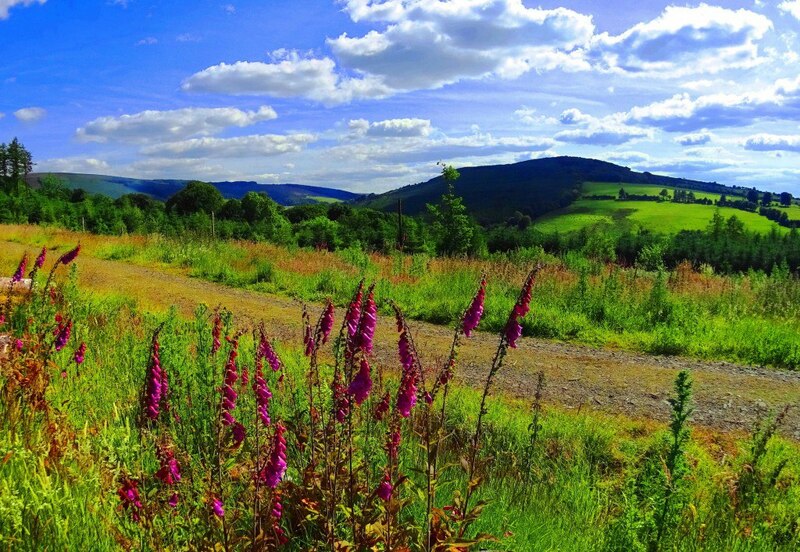 Celtic homesteads had been established for almost 1400 years already under the Medieval system back in Ireland and Scotland. Lords possessed the lands with Titles, the best of which long maintained crops, and were often inclusive of megalithic stonewalls that followed riversides to Cairns and Dolmens built in the Celtic era. 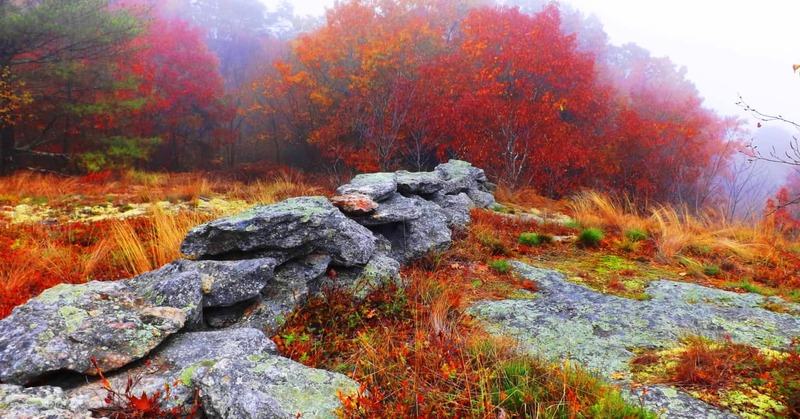 Men-of-property certainly made the connection that Cairns and Dolmens were a sign of ideal land, almost always placed near resources and advantageous elevations. 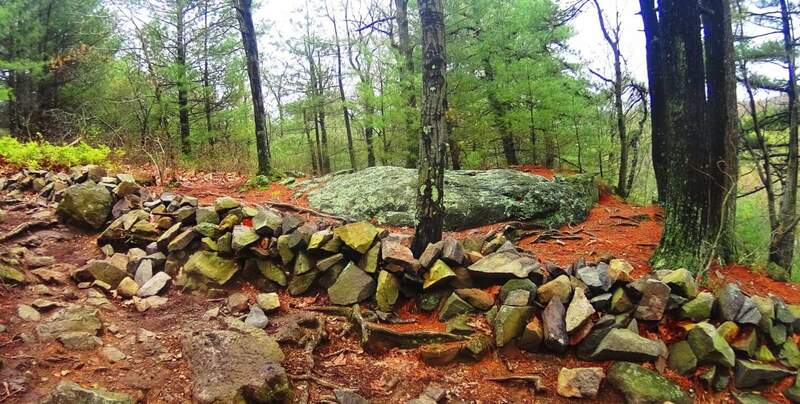 So it must have seemed miraculous to Colonial frontiersmen when they wandered into the forests and mountains of the “New World” only to discover megalithic stone ‘walls’ already running along the riversides, leading to the most advantageous plots, near streams, peaks, and good soil. 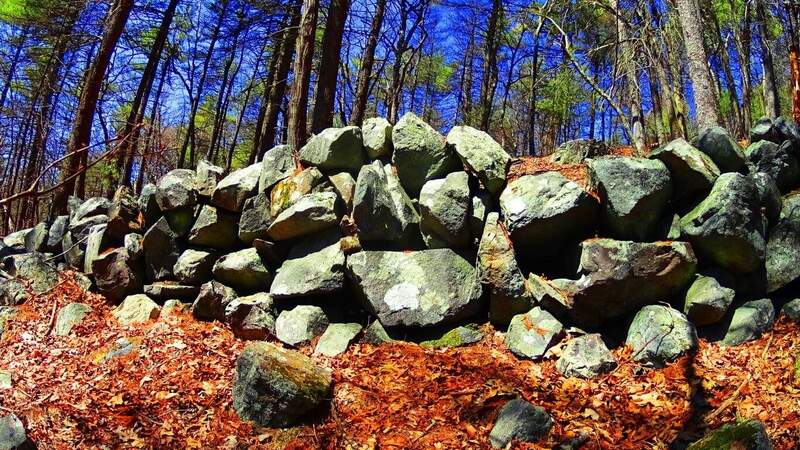 Imagine their amazement when they found stone Cairns in these lush areas, with corbel craftsmanship, identical to that of Celtic Cairns in Ireland and England. Native Americans did not claim the stonework. Natives were seasonally nomadic, and were in no way inclined to build stone cities. This is not dismissive of Native American anthropological development. Wooden ‘villages’ expanded into the hundreds of thousands in population in many areas, and were highly sophisticated, but they simply did not work with megalithic stones. 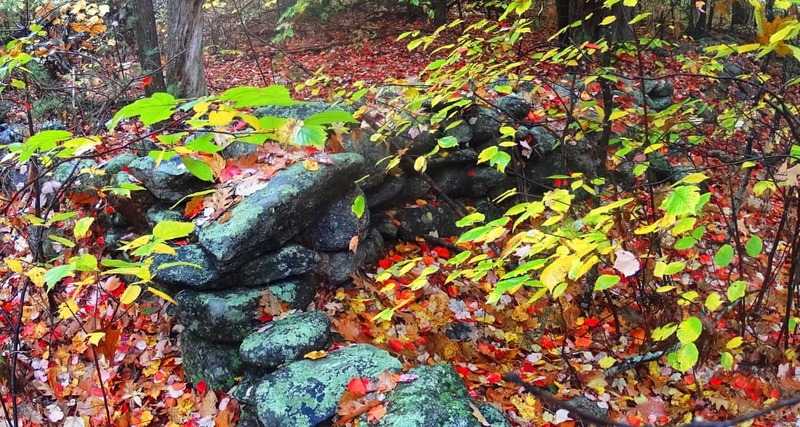 The Unspoken Thing: The unspoken thing about New England, the secret that has gone to the graves of almost every Native American tribe and Colonial woodsmen, is that America was once occupied by a megalithic culture, just like Ireland and England. Imagine if you were a Colonial farmer and you discovered this secret, that the soil and stonework of the ‘New World’ was of the same mystical sanctity of the lands Lords and Title holders had been possessing in domineering fashion throughout European history. Not only was the land giving you the essential signs of quality you were hoping for, but it went a step further, and somehow was revealing Celtic features that you could not in your wildest dreams have imagined existed in this part of the world. It was so completely familiar, but in an entirely new place. They absolutely would’ve taken this as a sign from God, and therefor fought with everything they had to keep it. I truly believe that this was a significant part of the reason why Colonial militiamen met the British on the field of Battle on July 4th of 1776. 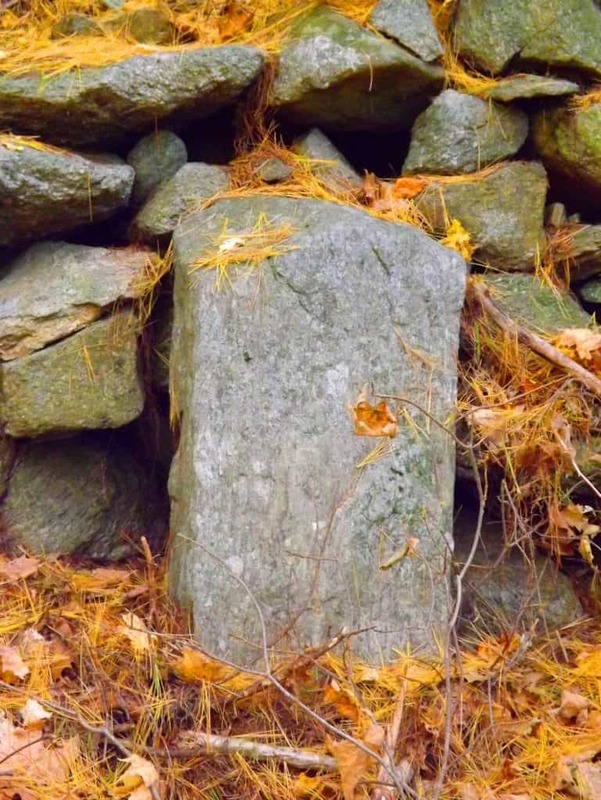 Colonial farmers must have had in-depth conversations about what they were finding in the woods, Celtic style stone-works that British Lords coveted and valued on their estates for centuries. It would’ve been the ultimate incentive to fight. 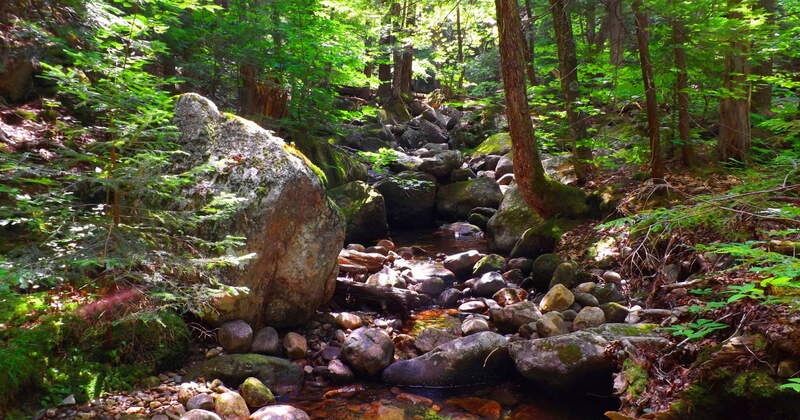 The Blue Hills Reservation is one of the most beloved remaining testaments to these wonders of the old growth forests, filled with Celtic stonework running along streams, small mountains, and rocky elevations. They are still there today, as the builders obviously intended. 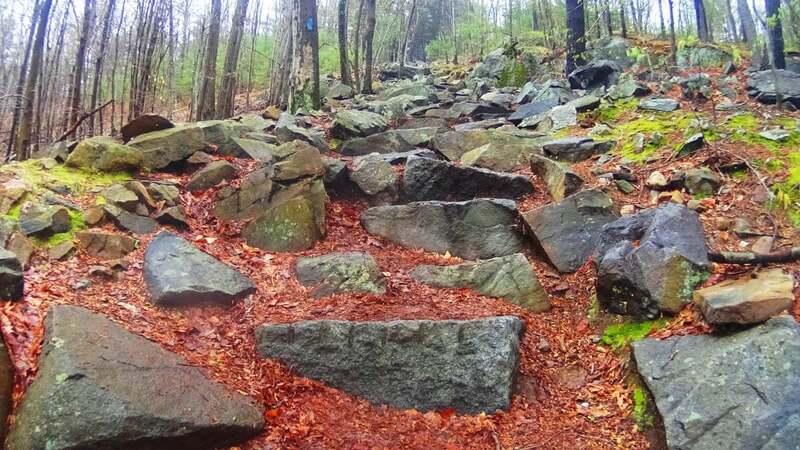 Connections to Ireland: The image below is a stone staircase at one of the main trails at Blue Hills. Notice how this first step is positioned, displaying the markings like an invitation, shown on the top frontal face, rather than tucking it out of sight as masons are trained to do. Whoever built this staircase wanted us to notice the craftsmanship. Everything about it says “notice me”. 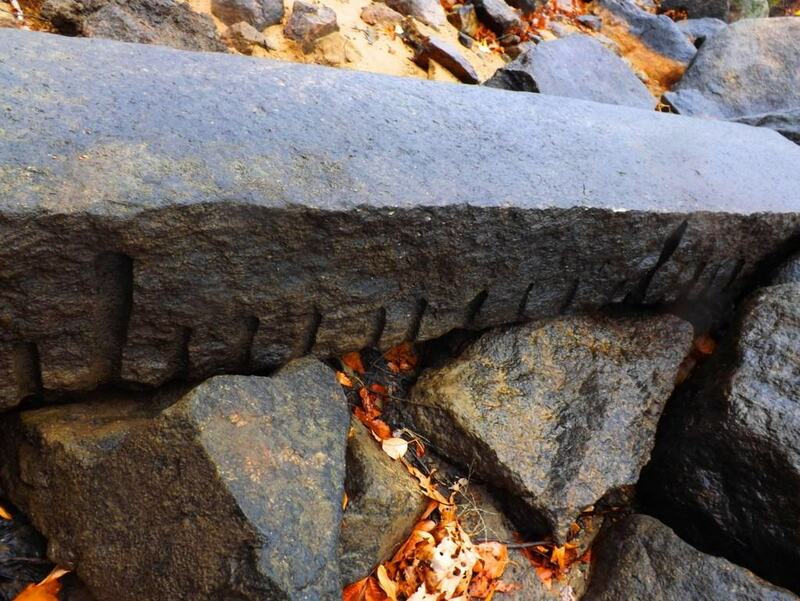 The style of incremented cuts on this blue granite stone is in the exact same style as cuts made to white granite on high elevation staircases at Mount Bearnagh, in the beautiful Mourn Mountain Range of northeast Ireland. 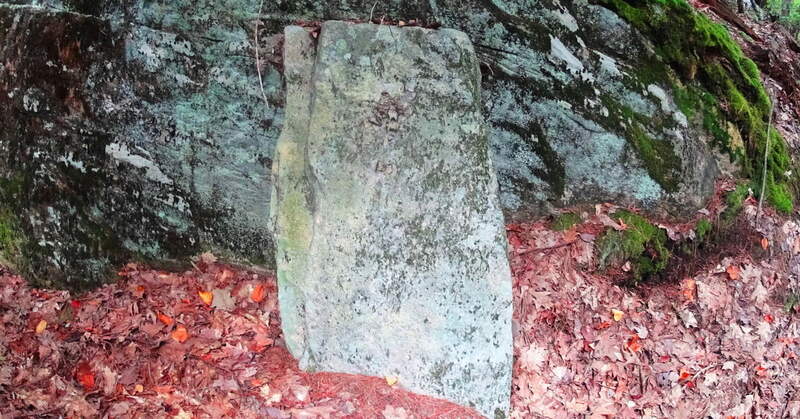 Here is a look at one of those stones below, quarried in the heights by stone stairs leading up the mountain, but was never placed in the ground for some reason. The styles are identical . And just like at Blue Hills, Mount Bearnagh is inundated with other stones all around, that have incremented markings, smoothed surfaces, and right angles. 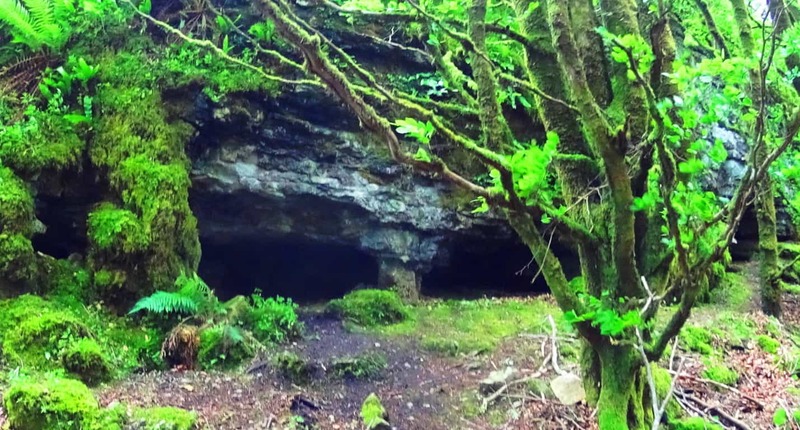 More Irish Connections/Stone-linings: The answer to the question is literally all around the woods: the Stone-linings. 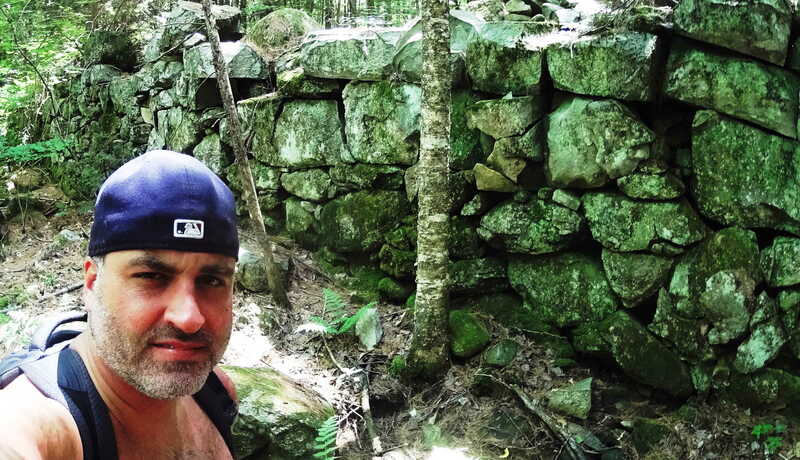 What modern anthropologists have mistakingly (and lazily) called “walls”, are more accurately understood to be ‘Stone-linings’ that run, like connecting cables, from peak to peak, and even zig-zag up entire hillsides in some areas. 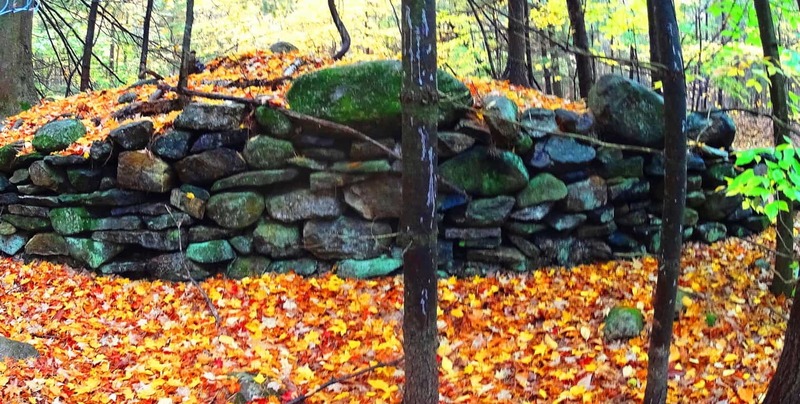 Who builds stone walls that zig zag up a mountain? No one. This Stone-lining phenomenon is also found at Mount Bearnagh in Ireland. 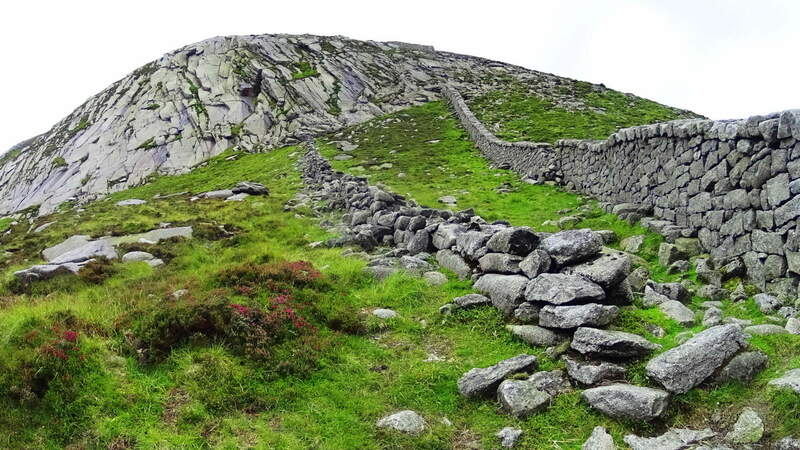 Here is a spot in Ireland that illustrates my point clearly; Please take a look at this image of two separate stone projects at the Pass in the heights of Mount Bearnagh; It clearly distinguishes the two structures as absolutely different. The stones on the far right of this image are clearly crafted as a wall, meant to contain flocks and cattle from drifting into the next valley. It was built by Irish masons in the 17th, or late 18th century. Notice how the stones of this wall are not aligned with the direct center of the mountain beyond, but is right-of-center of the peak, simply stopping once it reaches the cliff side. Since domesticated Cows and Sheep don’t climb vertical cliffs, the purpose of the structure is obviously complete, as a wall. 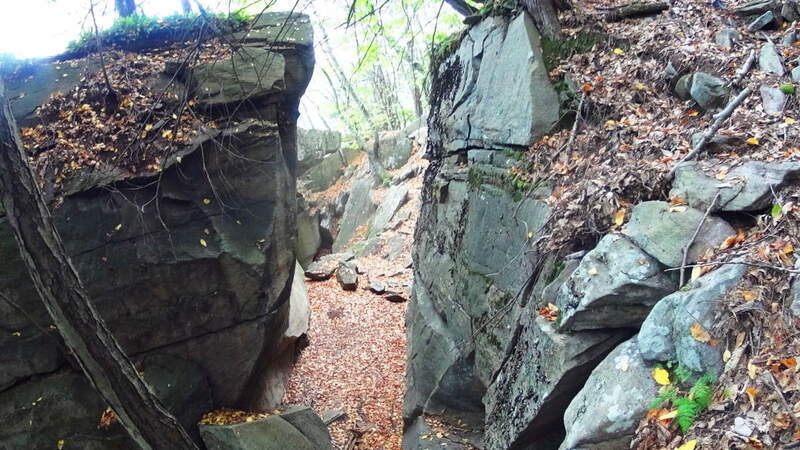 The project on the left in the image, however, is a Stone-lining. It obviously cannot stop the movement of anything. I believe this ‘Lining’ was built by the very first culture in Ireland. As you can see, the stones specifically align towards the center of the mountain beyond, and actually continues up the mountain in massive stacked shelves (if you look close), all the way to the center. What this image doesn’t show us is that in the other direction, the Lining continues towards the center of the opposite peak in the same way. 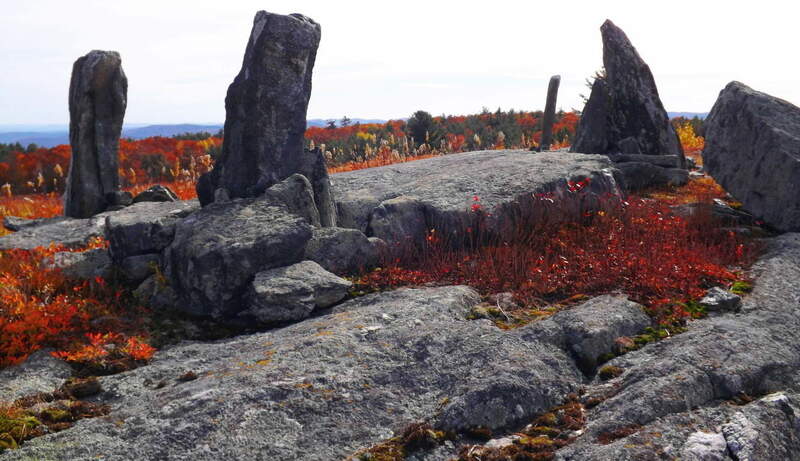 It is evident that this megalithic period structure was intended to connect the peaks, like cables connecting power sources. 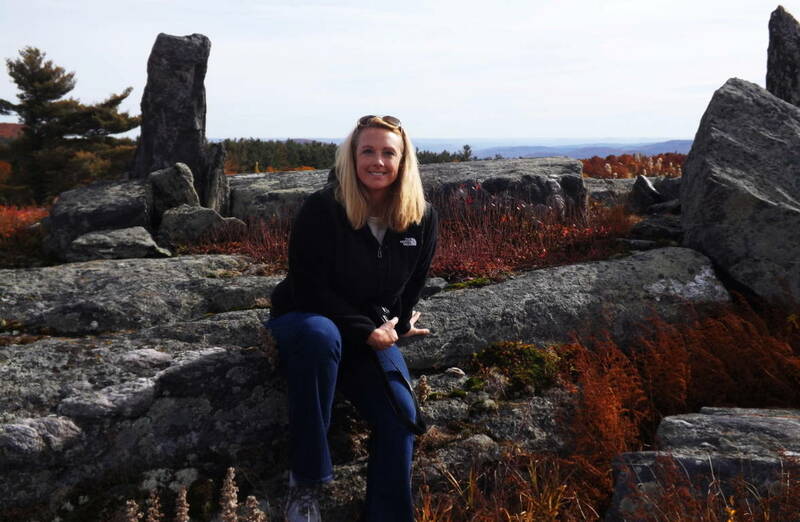 I have found this same phenomenon at Glenveagh National Park, Ireland, Mount Chocorua New Hampshire, and Mount Monadnock, New Hampshire, as well as dozens of other places. 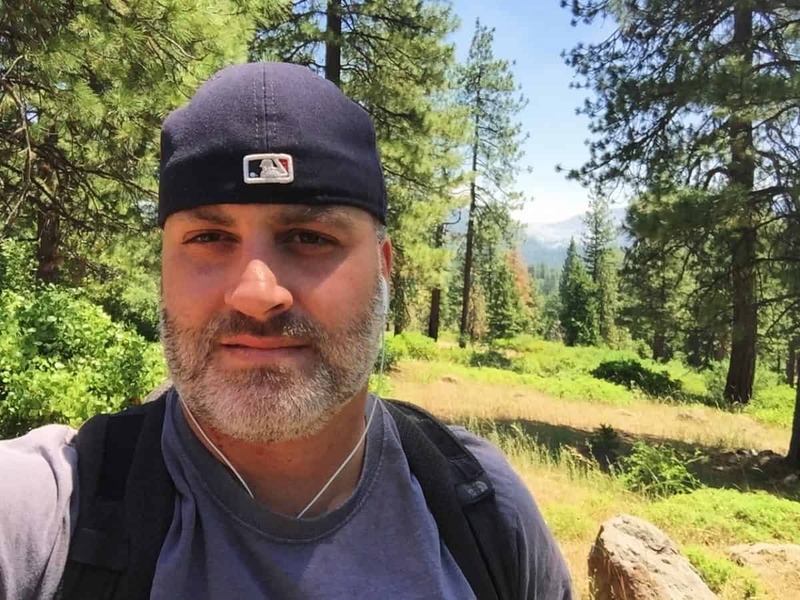 (Noted here on Stonetstrider.com.) One more important thing to consider is that the Irish did not take stones from the Linings to build the wall; Why not? It’s right there, why not use it? The answer is, the Lining is ancient, and sacred, and the Irish know it. They would not touch it. 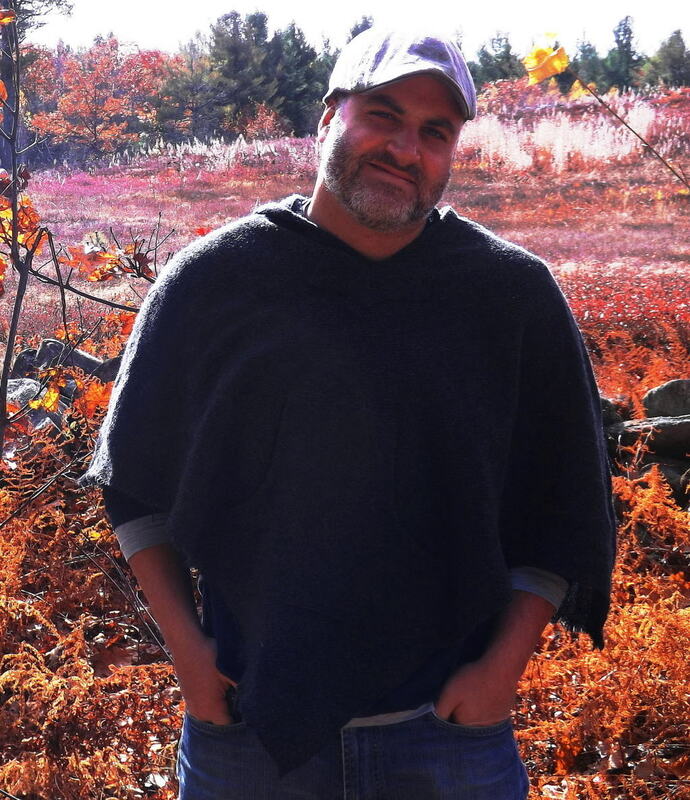 If we now understand that Linings are sacred, and the Blue Hills is literally covered in massive megalithic Linings, that makes the entire Blue Hills Reserve sacred. 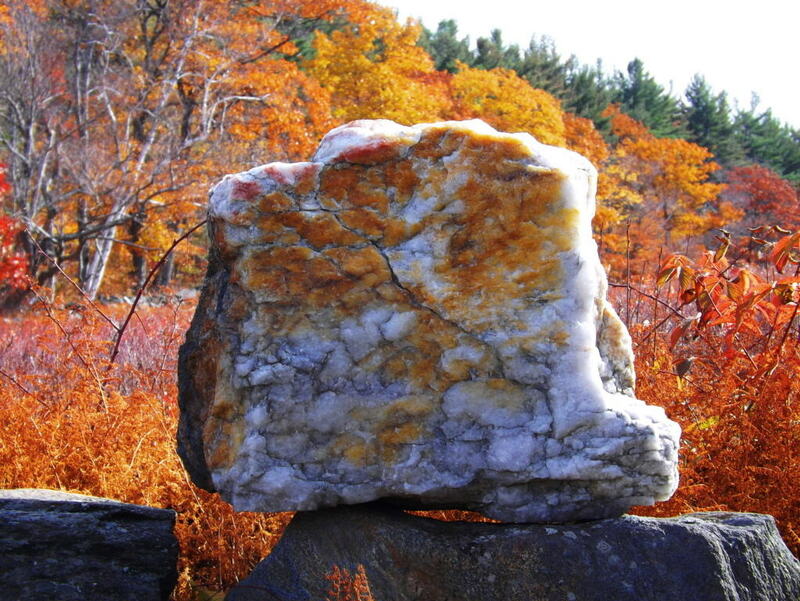 Stone-linings (Linings) at Blue Hills: The Blue Hills is a Stone-lining universe. 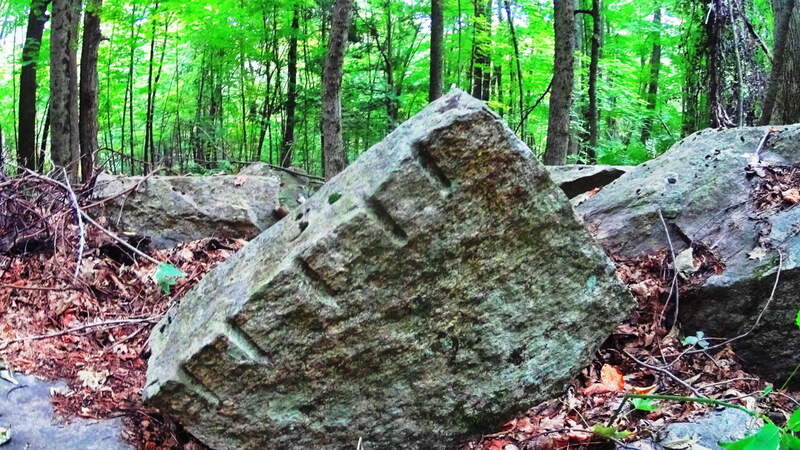 Colonials would’ve seen these stones and been absolutely stunned. Some of them connect the peaks, others zig-zag up the hills as i mentioned before, and some “crown” the massive stone ledges around the peaks, like at Mount Watatic, Massachusetts, (also featured here on Stonestrider.com.) 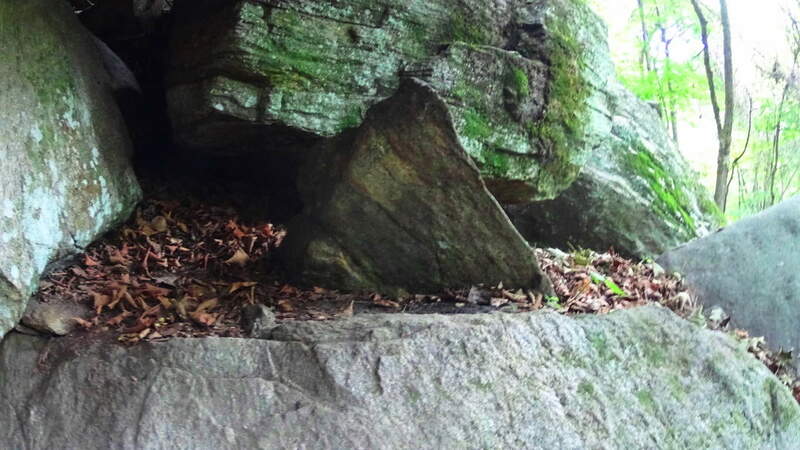 The image below is an example of a fine Lining found on one of the elevated porches at Blue Hills. 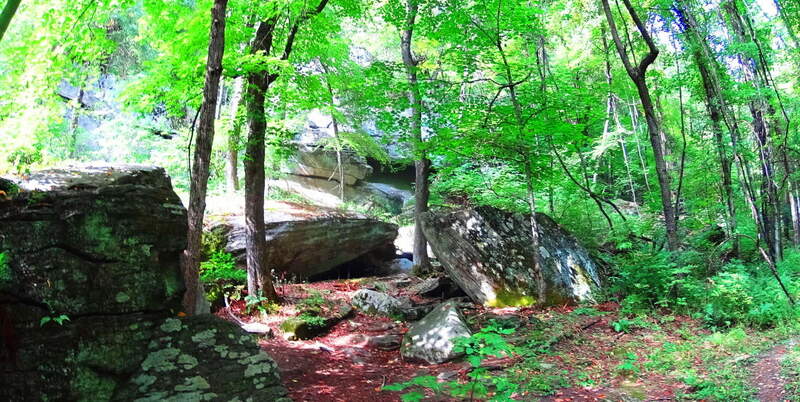 The next Lining is much more substantial, and running straight up the side of one of the small mountains at Blue Hills. There are literally hundreds of these Linings, requiring more work and tools than any team of New England craftsman could ever in ten lifetimes complete. 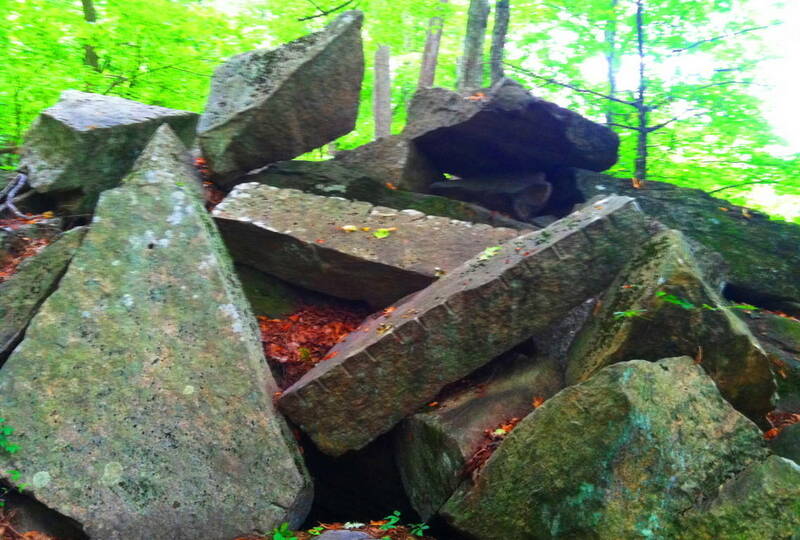 And where are the tools that quarried and crafted these stones? No signs of them, anywhere. 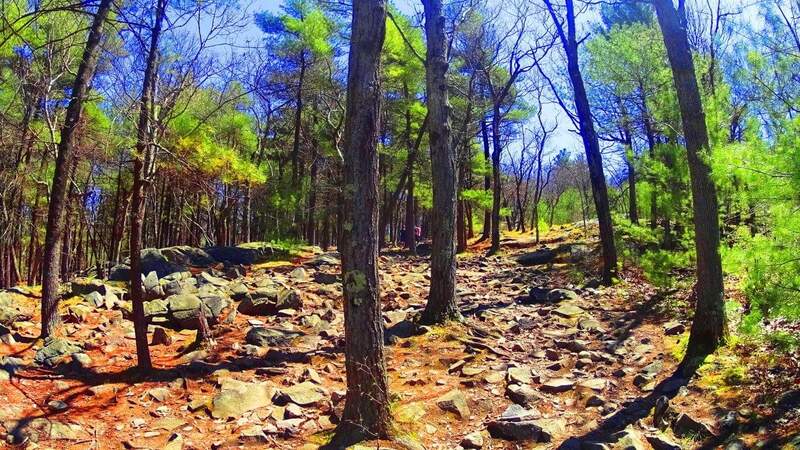 Here is a dizzying look at several Linings zig-zagging up the mountain side just off one of the trails at Blue Hills. 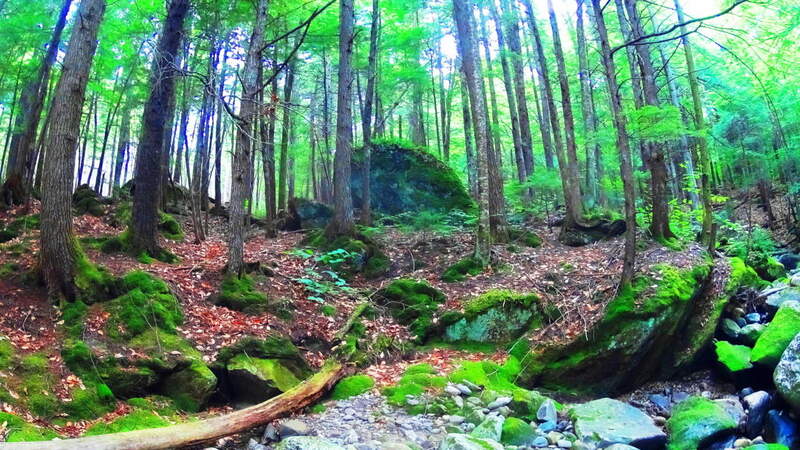 I believe that the stones were part of this scene long before the trees were there. 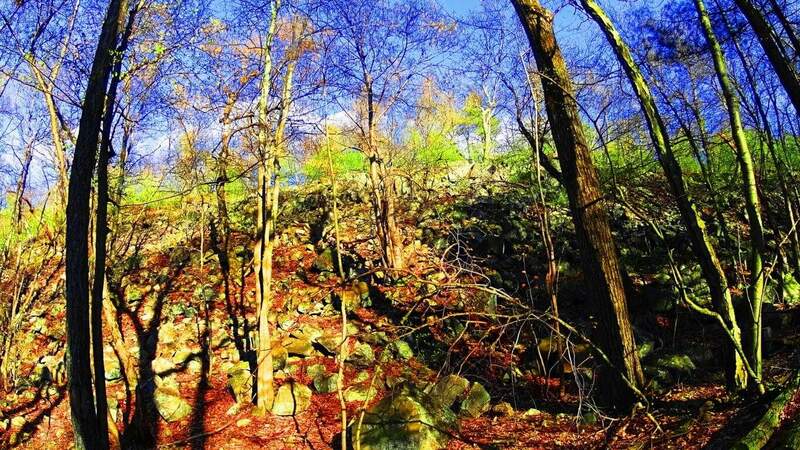 At one time, this hillside looked a lot more like Celtic hills, unobstructed visually. 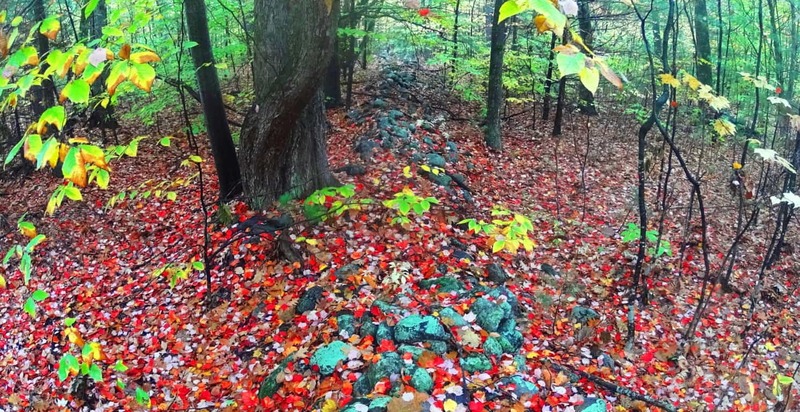 It is harder to see megalithic patterns in New England with countless layers of leaves and trees, but there is some kind of pattern here. 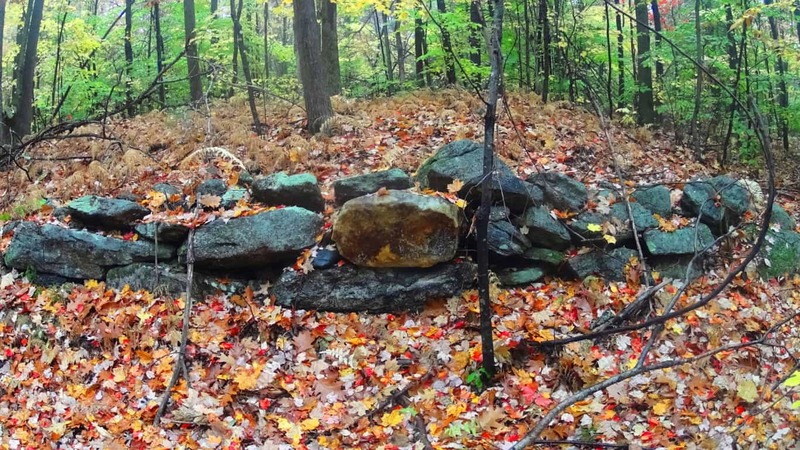 Its almost as if the entire hillside is a megalithic statement. 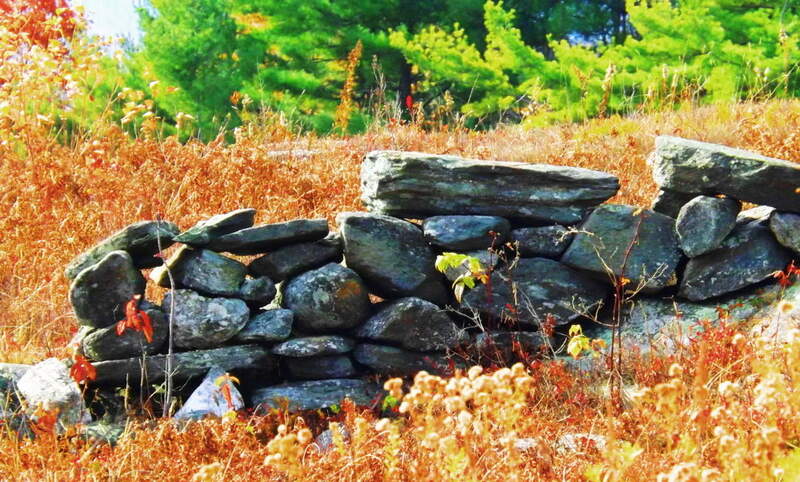 The picture below is a hill about 100 yards high, with Linings of 100 to 1000 pound stones everywhere. Unreal. A glacier ripping this hillside would’ve discombobulated any pattern in the stones, not stacked them into Linings that looked to modern eyes like dilapidated walls. Ice did not do this. 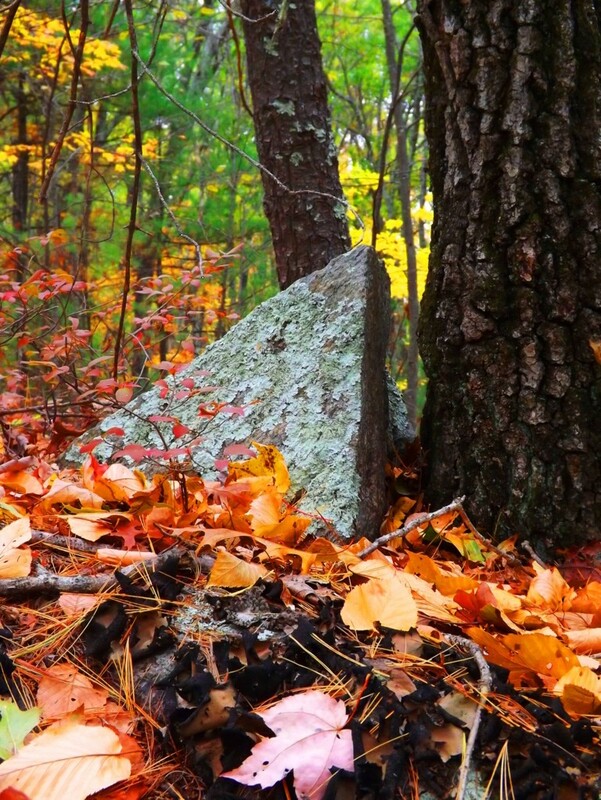 If you follow the Linings through the woods at Blue Hills you will often come across what look to be megalithic size markers, Standing-stone scale slates or boulders that seem almost decorative, or for marking the territory. 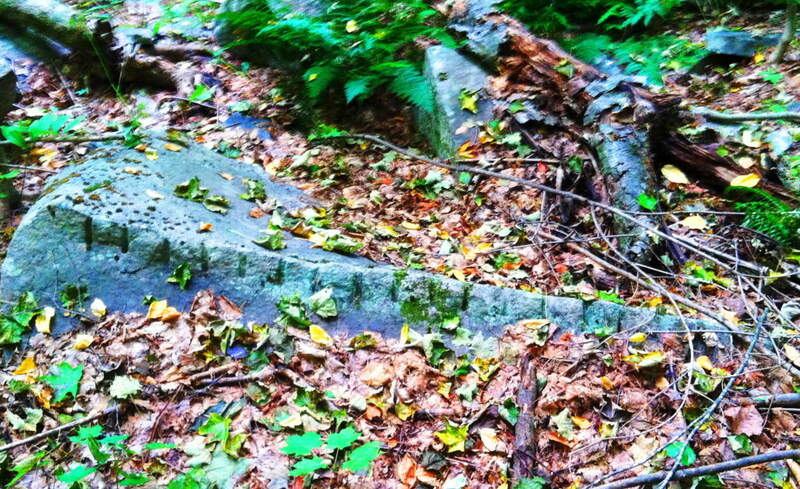 Take a look at this 7 foot long, 1 foot thick, slab placed along the Lining by one of the lower trails. It looks to be at least 1 ton in weight (2000 pounds). There are cuts on the lower right side of this slab rendering some kind of meaning. It was clearly placed there. 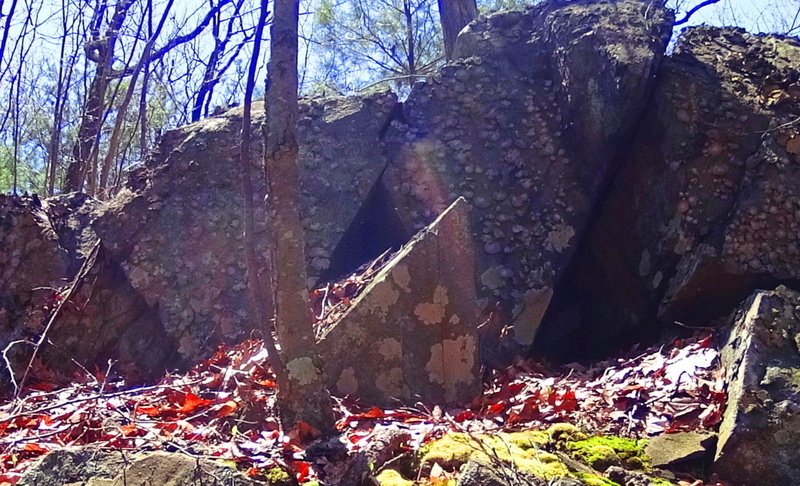 It may mark a certain point of the Sun or Moon along the mountainside, or be indicating a direction to follow, all of which are possibilities that the Megalith builders were absolutely concerned with. 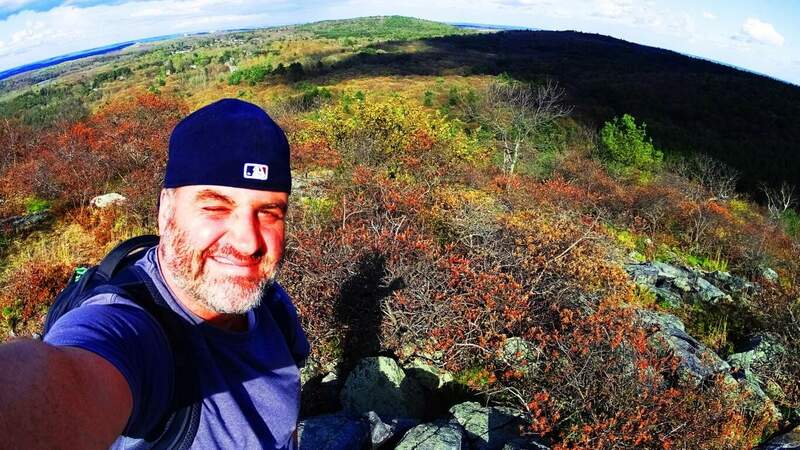 Elevated Trails at Blue Hills: People from this area of New England love hiking here. 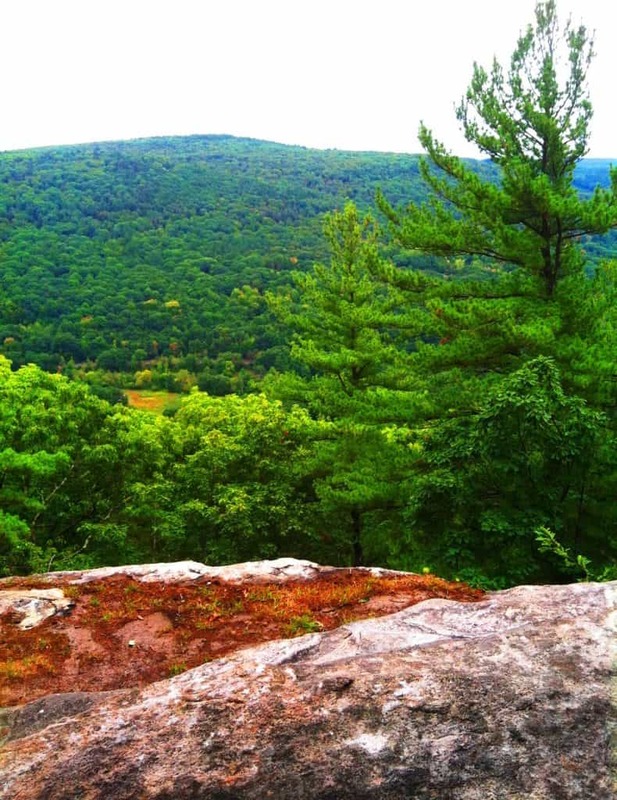 With all the stonework taking place beneath the trees, it is impossible for a hiker not to be curious what might be taking place at the hilltops, under the Sun. 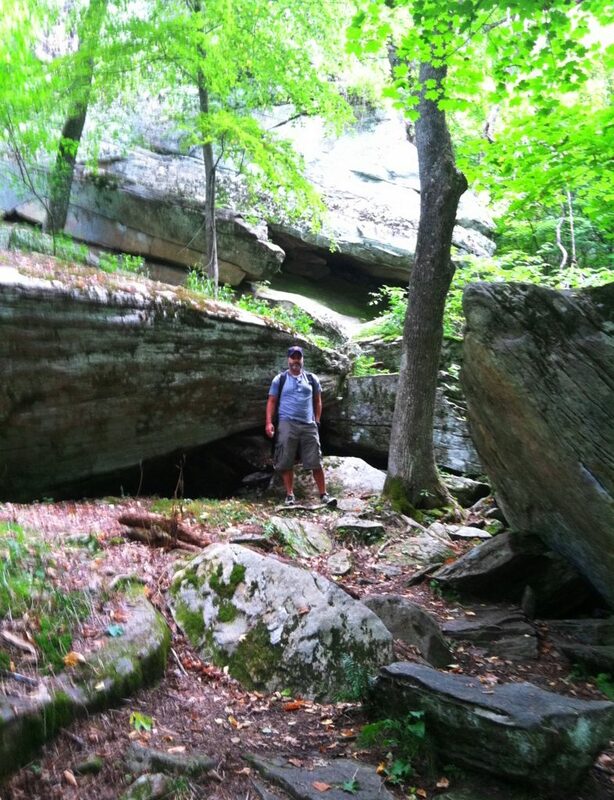 There are trails that loop in a lengthy approach to the smooth stone porches above, but there are also very direct trails with serious inclines that will take you to the best peaks within 15 intense minutes. 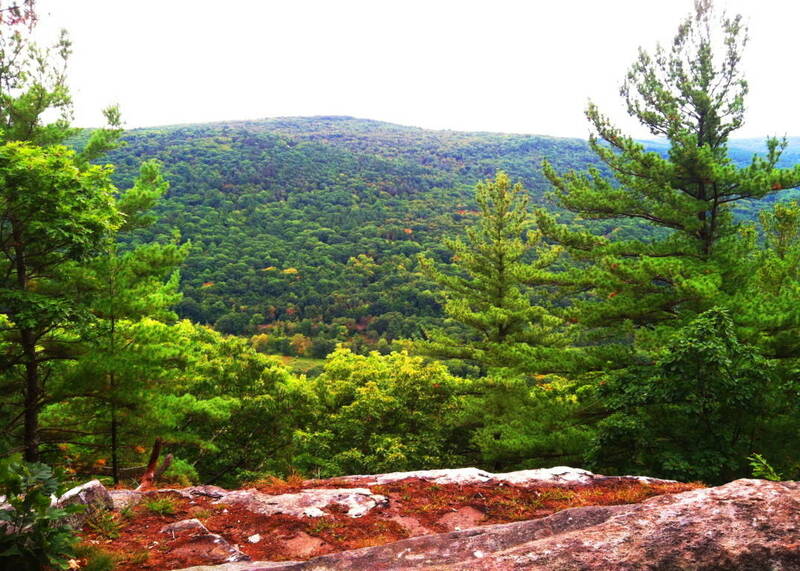 One peak has a direct view of Boston twenty miles away, with beautiful, Celtic looking, old growth fauna along the ledges (Image below). You can just make out Boston in the distance. 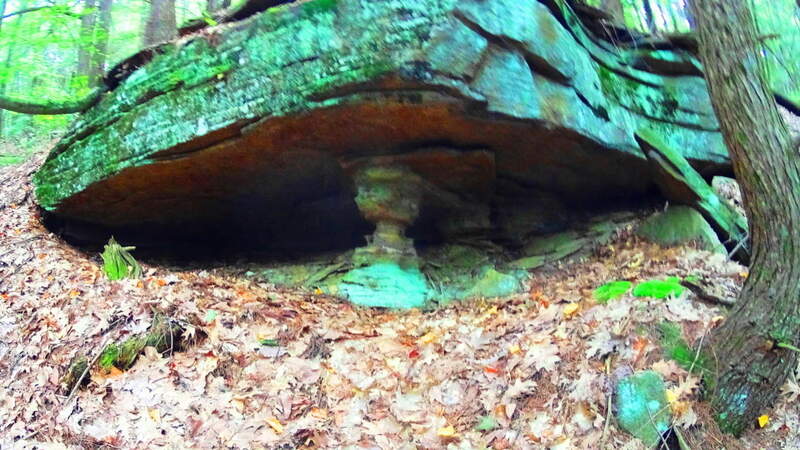 Along these smooth rock porches are stones that are obviously crafted, and serving as markers of some kind. 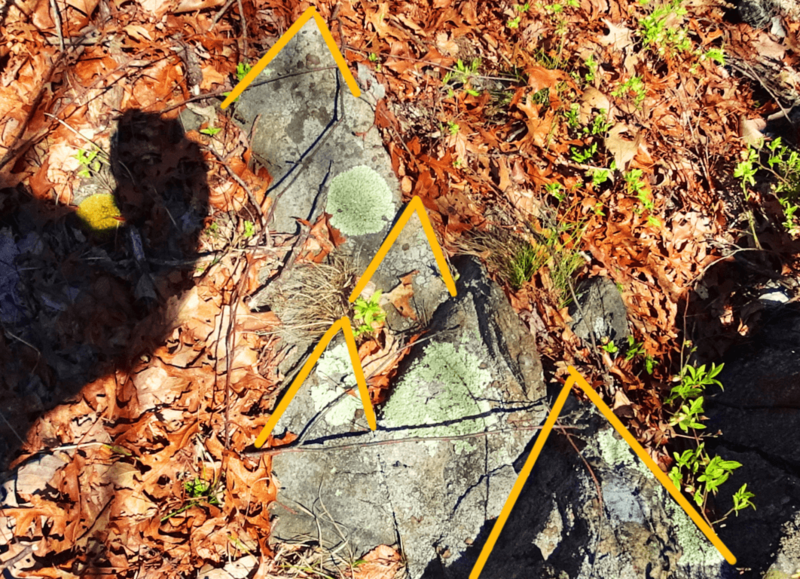 Take a look at these stones on the upper path of “Skyline Trail”, the most popular trail at Blue Hills: This stone is clearly crafted. 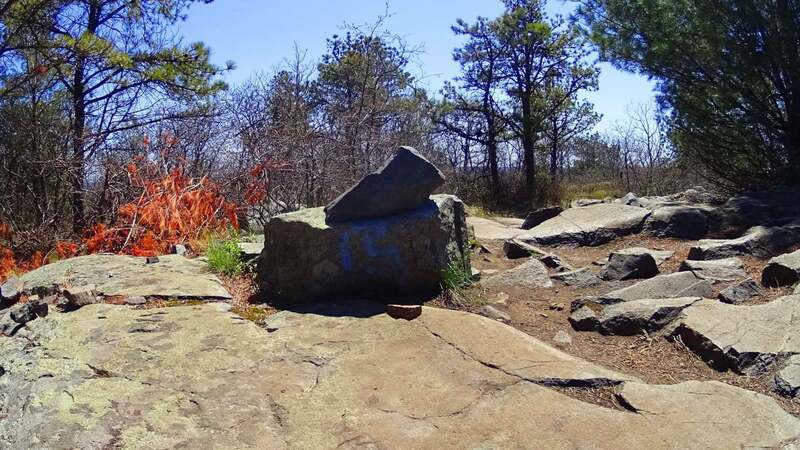 Furthermore, looking from this exact stone down the direct path of the trail, are two more crafted, free sitting boulders, perfectly aligned like 1,2,3. 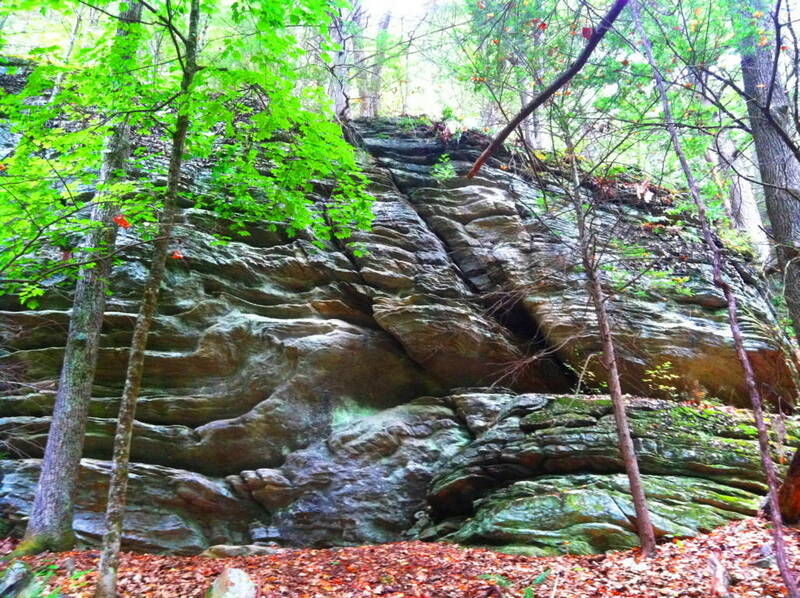 Around this area are also stones that have clearly been cut away from cliff faces. 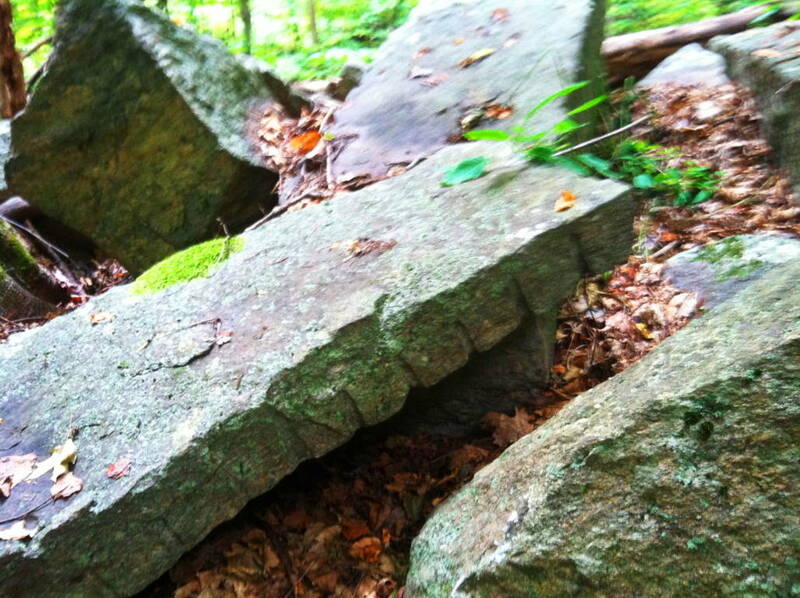 Take a look at these triangular stones, still standing near the exact indents from which they were cut away from. 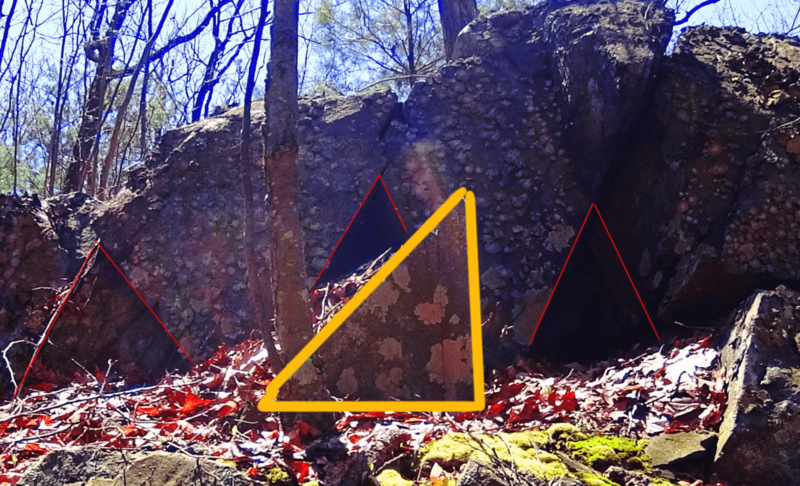 Just for clarity, I highlighted this image so you could see the exact spaces of the cutting, and the right angled triangle stone. This is evidence of extremely intelligent craftsmanship, conscious of geometric principles. 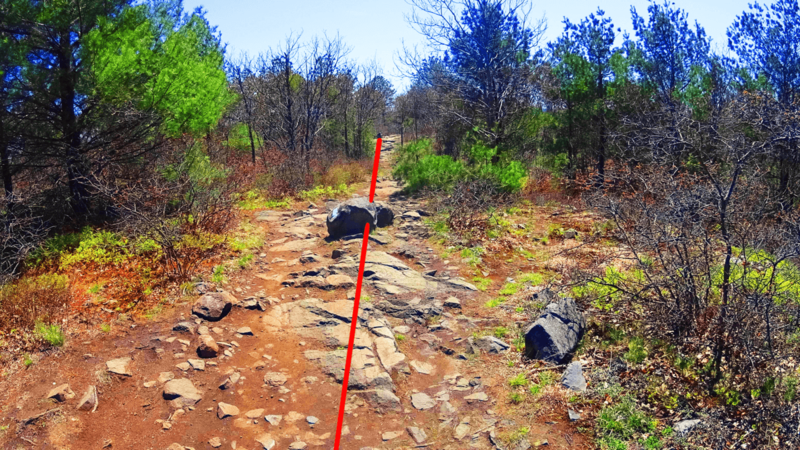 There are also more minor cuts in the stones along the trails, with triangular features. Below is just one example of thousands. They seem directional. Amazing. 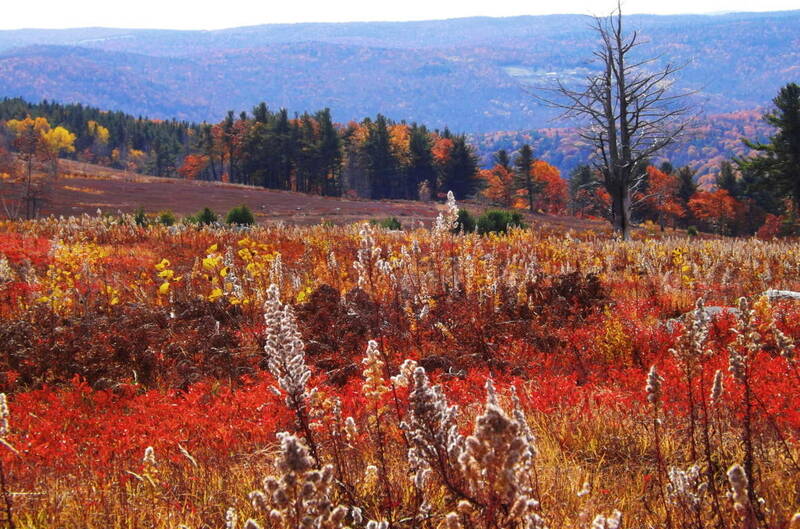 The view from the top of Skyline Trail is a classic New England picture. The shadows on the dark granite ledges give a bluish hue to the stones, most likely where the name for this beautiful place derives (top images). 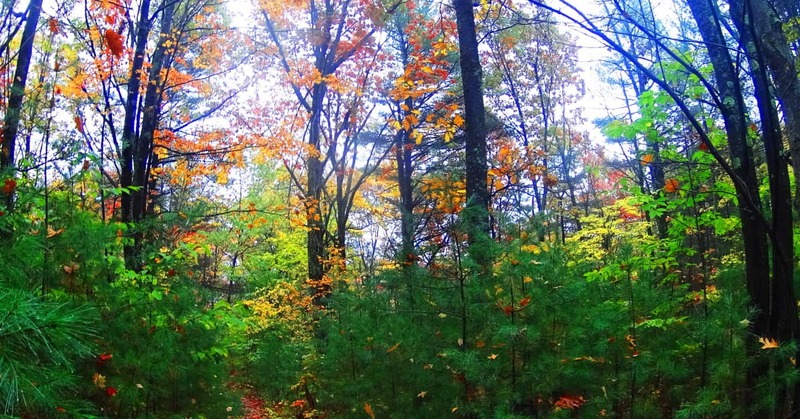 We should remember also, that these trails were used by the Native American tribes for thousands of years, before it became “New England”. For the most part, they have taken their sacred knowledge with them into history. 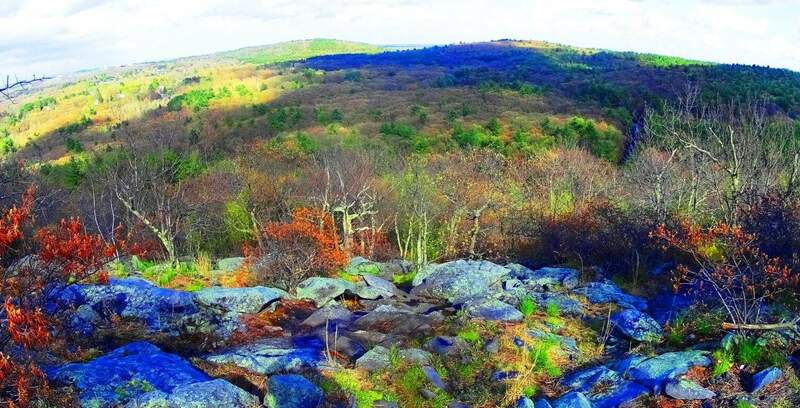 Take a hike through the Blue Hills, and see for yourself the unspoken reasons why a community of poor colonial farmers risked their lives against the greatest empire the world had ever known. They knew what we are quickly forgetting, that something entirely mystical took place on this sacred land. Find it, if you can, and go strong. 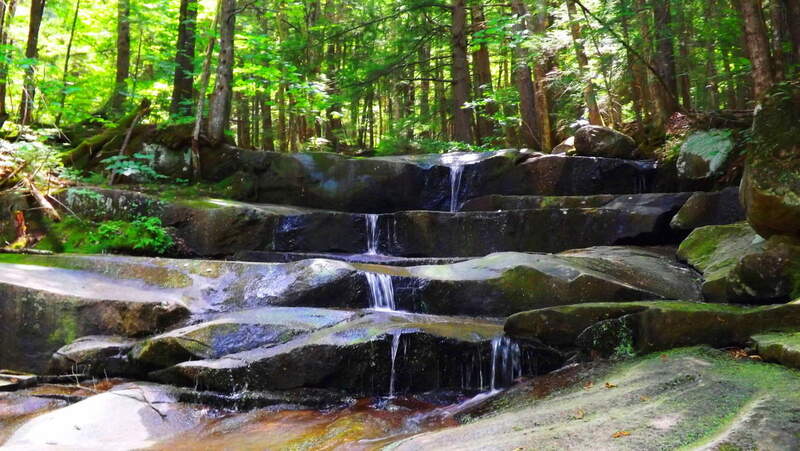 Note: Sculptured Rock Natural Reserve is a watery wonderland of falls rushing within the forests and small mountains of Groton New Hampshire. 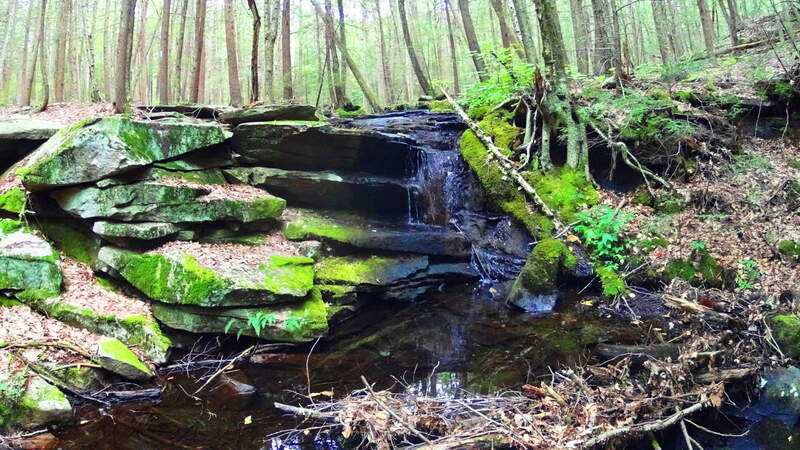 A hiker has the option of following the falls as far as they wish by hopping from stone to stone, or perhaps stopping to splash around in the amazing still pools created by the rocks. 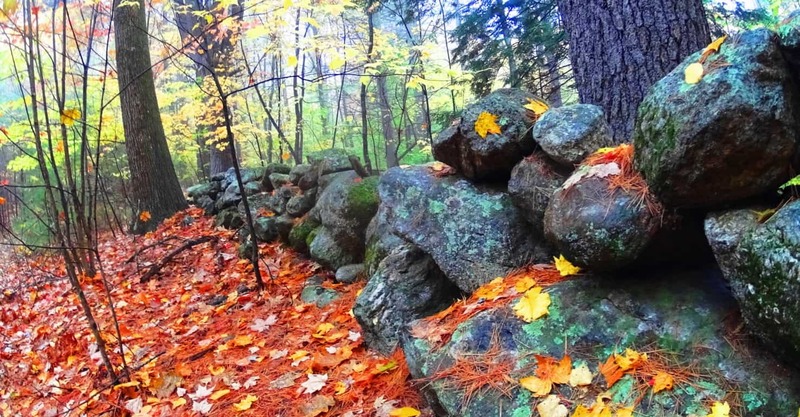 Trails also run away from the fall into the forest, where other works of ancient stone and crafting can be found, such as Cairns, and ‘directional stones’ from another epoch. 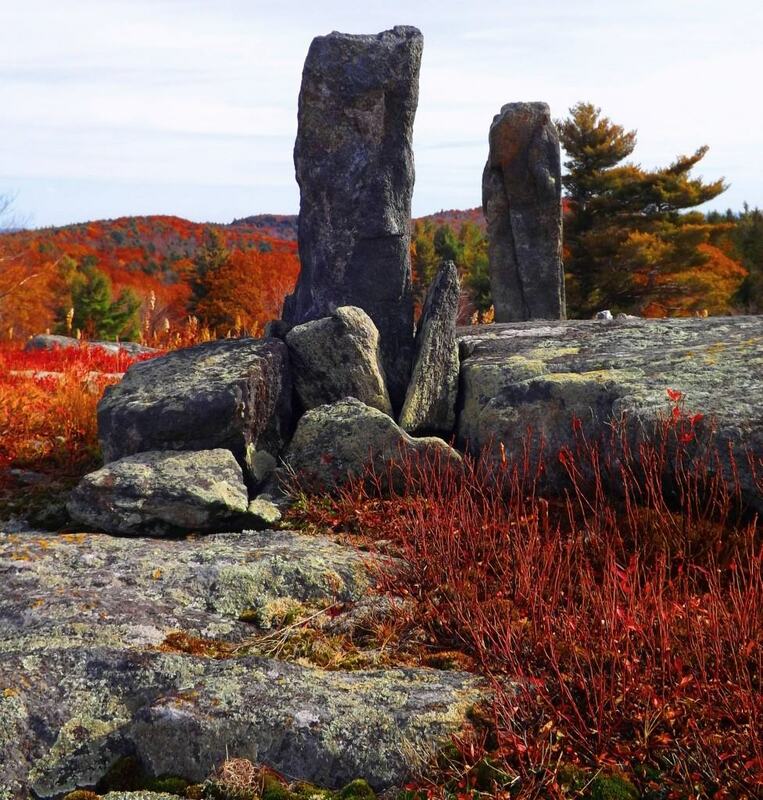 The area is a notable anthropological site, with an authentic ancient stone dwelling nestled close to the designated forest trail, and several massive stone enclosures of megalithic scale further down the fall to the south. 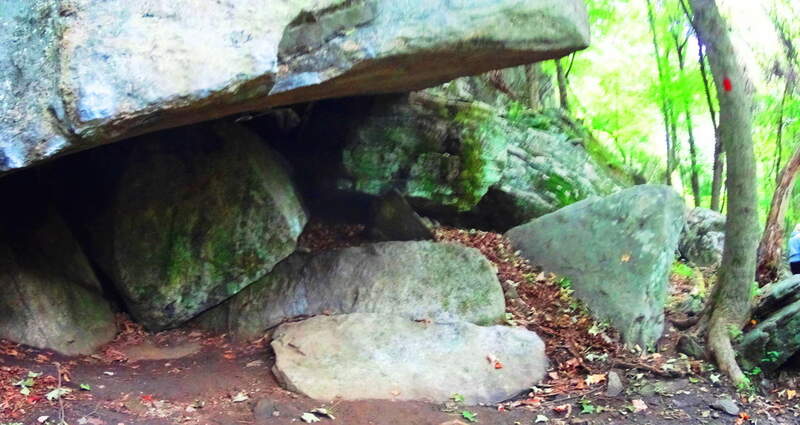 I believe these works, due to their scale and placement, to be PRE Native American, built by a culture yet to be acknowledged by current anthropological historians. The main water artery, the Cockermouth River, is filled with free standing boulders that sit in an incredibly smooth stone tunnel of what looks to be sculpted rocks. 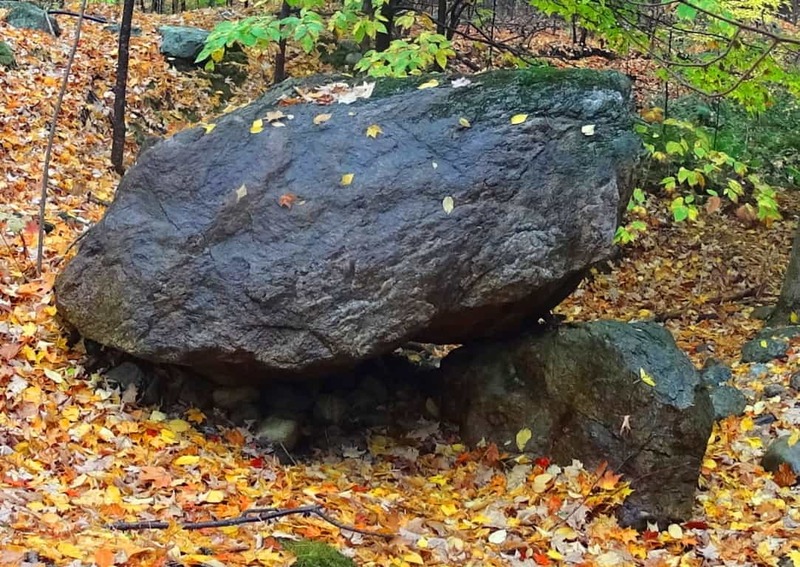 This is very similar to the style of many free standing boulders in Northern Ireland’s rivers, but on a much larger scale. 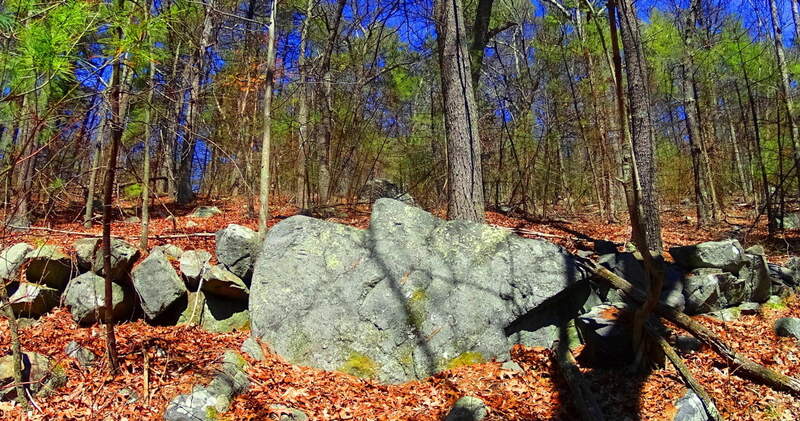 There are literally thousands of these free standing boulders. Away from the Cockermouth River, further north, are several wild rivers without trails running up small mountains enclosing the area. 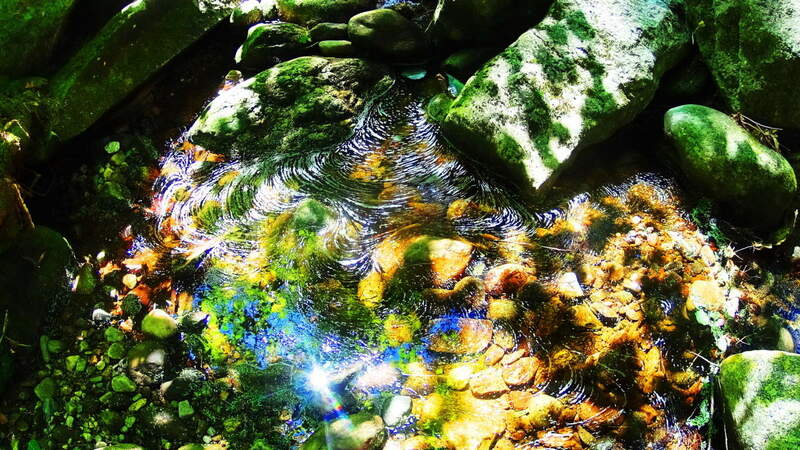 For an experienced and prepared hiker, I recommend the very real adventure of following a waterfall up the mountain by stepping on its stones. Following small mountain falls is an amazing experience due to the fact that the features of the fall become increasingly impressive the higher up you go. Wide stone porches and steps that look to be carved right out of the mountain support fully flowing falls that dance down the stones. 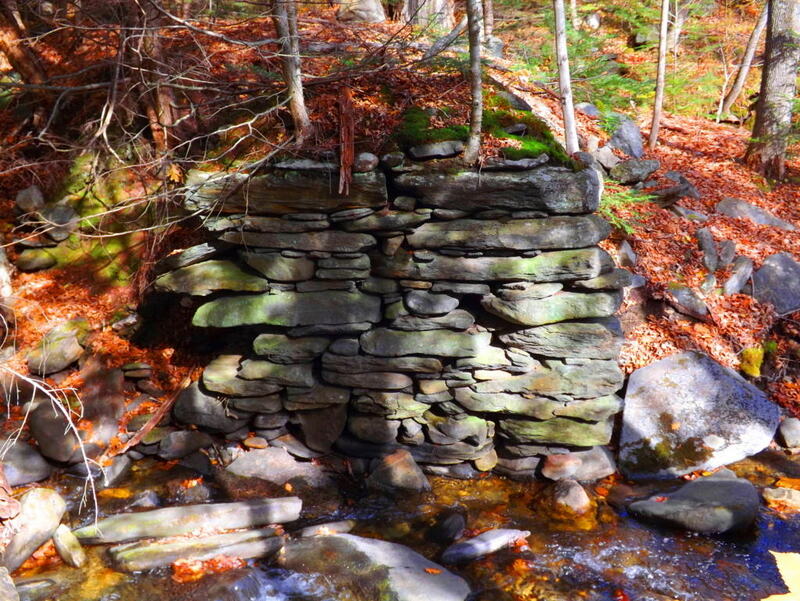 Somehow these features leave plenty of dry space along the way, allowing for great footing beside stone porches and pools while ascending the fall. 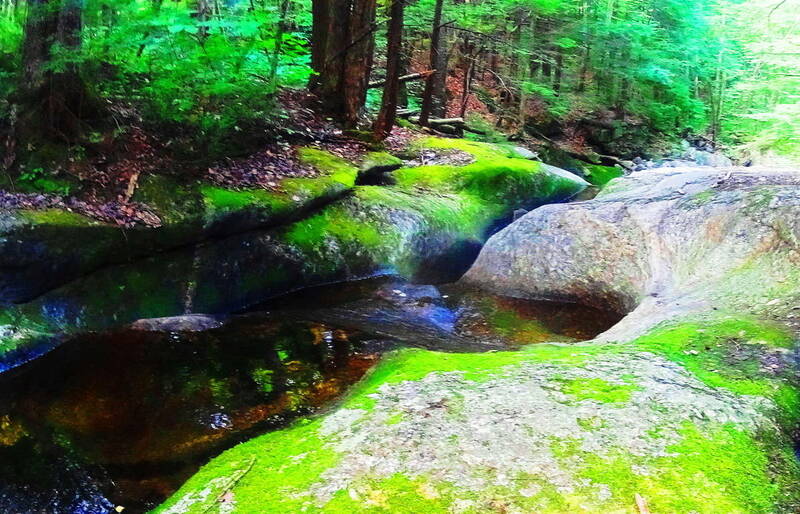 One of the best parts of following a wild fall in New Hampshire is the option to jump in, or plop down in the middle of water-slide like tube of water-flow, and cool down along the way. 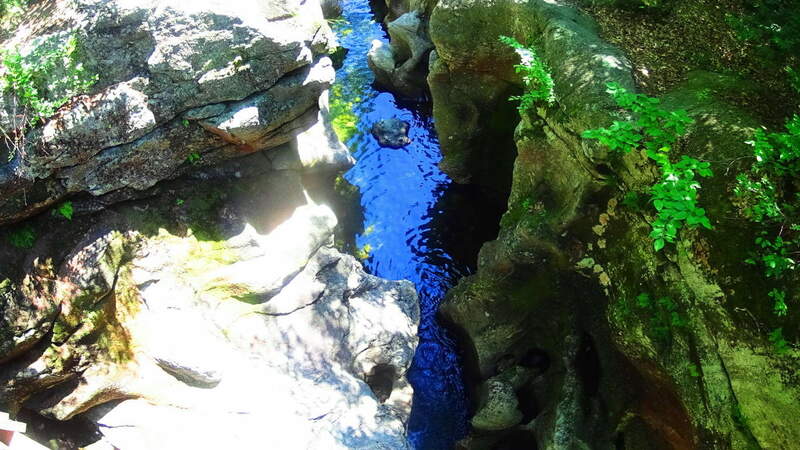 The beautiful combination of sculpted waterways, dynamic waterfalls, ancient forestry/ stonework, literally from the beginning of time, make Sculptured Rock Reserve one of the best kept secrets for outdoor enthusiasts. 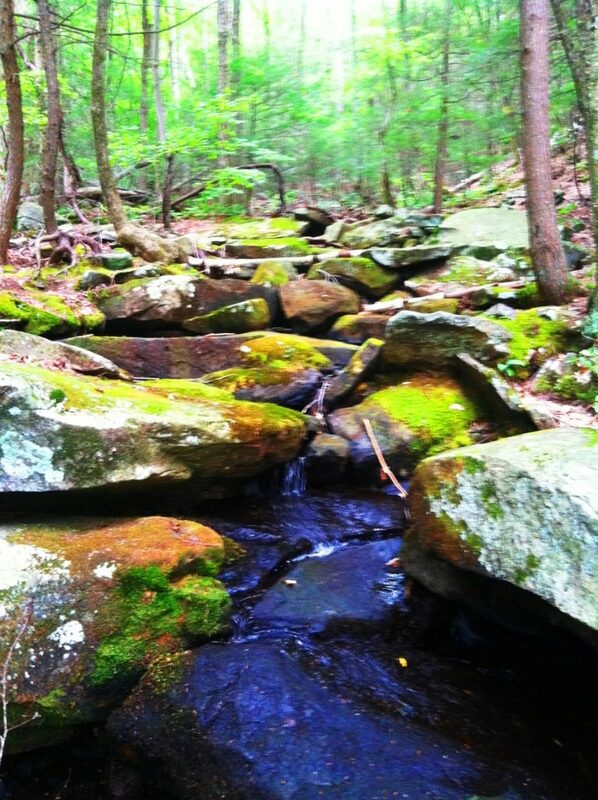 It is one part water-filled canyon, another part Celtic rock haven, with waterfalls that truly spark the imagination. 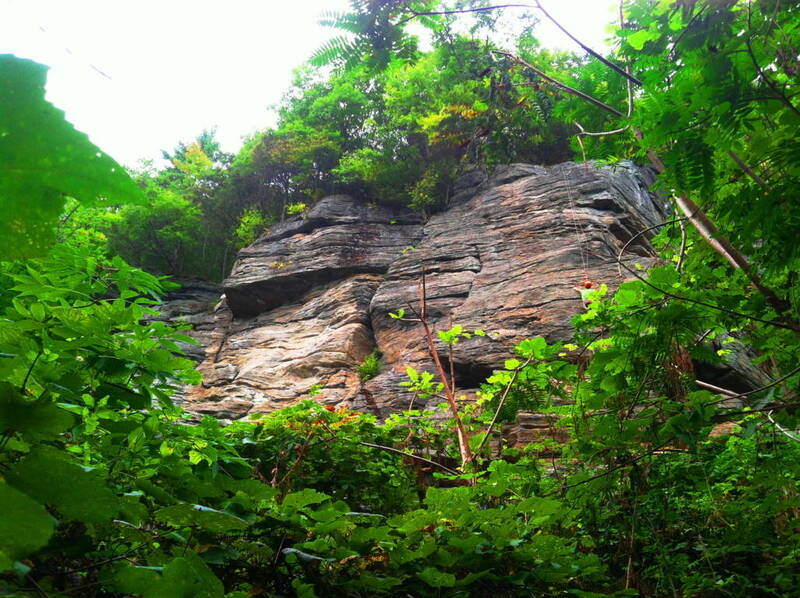 Sculptured Rock has a sacred feel. Seek it out.